In Part I of the book The Practice of Community Health and Democratic Leadership Richard Couto uses these principles to outline the stories of the twelve community leaders with each of the six chapters focusing on one of the principles. The twelve highlighted CHLs work on areas such as access to primary care, AIDS, drug and alcohol addictions, diabetes, disability, homelessness, school-based health care, and community-based health improvement. Their work takes place with Native Americans, migrant workers, Central American refugees, inner-city residents and the urban poor. The case studies have been constructed from interviews with CHLs, newspaper reports and other documentation. As such these six chapters are rich biographical accounts - essentially personal stories of community organisation and programme development. Part II of the book - The Principles of Community Health and Innovative Democratic Leadership - is divided into three chapters and here the focus is on examining the narratives of Part I in order to consider the 'principles of innovative leadership in health, community and democracy' (p.169). In Chapter Seven Couto considers how current health care practices in America contrast with the values of health and health care demonstrated within the highlighted projects. He considers the relationship between class, culture and economics and problems in health care and argues that healthy assertiveness and communal bonds (amongst other things) are indicative of innovative democracy. In Chapter Eight the focus is on the importance of leadership to make things happen and the argument is that commitment is the key issue here. In this chapter Couto also identifies the importance of 'working with self as well as working with people' (p198) as essential dimensions of leadership. 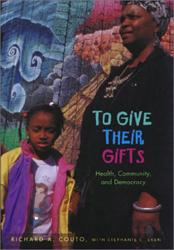 In the conclusion Couto considers the relevance of Richard Titmuss' concept of a 'gift relationship' to understanding health, community and democracy ( Oakley & Ashton 1997). Although not strictly a sociology text Couto draws on sociological theory and method in his analysis and discussion. The main strength of the book though is its powerful portrayal of community organisation and development. This book will be of interest to anyone working in the areas of health and health care and comparative social policy. OAKLEY, A. & Ashton, J. (eds. ), The Gift Relationship: From Human Blood to Social Policy by Richard M. Titmuss (original edition with new chapters), London: LSE Books, 1997.